Thrangu Sekhar Retreat Center is situated in the hills forming the eastern rim of the Kathmandu Valley, just below a cave used by the revered Tibetan yogi, Milarepa. 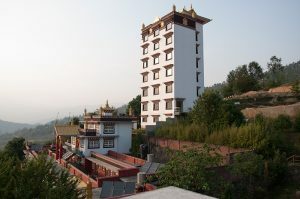 It was established by the Lord of Refuge Thrangu Rinpoche to serve as the main retreat for the Thrangu Monastery lamas selected to undertake the traditional three-year three-fortnight retreat. Thrangu Rinpoche named the retreat ‘Sekhar’ after the famous tower built by Milarepa during his arduous training under Marpa Lotsawa. In 2004 Thrangu Rinpoche requested Drupon Khen Rinpoche to be retreat master, and since accepting, six cycles of retreat have successfully been completed under his guidance, with the seventh cycle currently in progress and the eighth commencing soon. Alongside this, Drupon Khen Rinpoche has established a separate six-year retreat programme for international students. There are around ninety people practising in long-term retreat. Alongside the four meditation sessions, teaching and study form a vital part of daily life at Sekhar, as they are the essential basis for the three stages of learning, contemplation and meditation. Drupon Khen Rinpoche is in residence nine months of the year, and works tirelessly to teach and guide the different groups of retreatants, giving special emphasis to the pith instructions to correct the erroneous views preventing each student making progress. He also teaches a class every five days for the monks who are responsible for the day-to-day running of the retreat. All the international students come together as a group for the second meditation session of the day, which Drupon Khen Rinpoche himself attends, often​ giving heart advice. In addition to teachings from Drupon Khen Rinpoche, the retreatants are extremely fortunate to be able to receive empowerments and advice from Khenchen Thrangu Rinpoche several times a year. They are also taught the procedures for the practice rituals by Drupon Lama Dawa Phurba, and Drupon Khenpo Wangchuk gives extensive explanations of the treatises. The learning of Tibetan language also forms an important part of study at Sekhar, and it is the home of the Marpa Translation Society. Most retreatants on the six-year programme study Tibetan and Drupon Khen Rinpoche himself teaches a class every five days. However, those on the translator training programme give language training special emphasis, with the aim of helping others on the path of dharma through the work of translation. As of the beginning of 2018, 15 children have been accepted by Drupon Rinpoche for training and their ongoing study of Dharma and languages is overseen by him. The five African children are at present engaged in studying Tibetan, French, English, and Swahili so that they will have the language skills to one day teach widely in central and southern Africa, and the two elder have now also begun memorising Entering the Middle Way root text. The young monks of Thrangu Gompa will continue to study Tibetan and English, alongside memorise the root texts of the five major topics; while the youngest three are just beginning to learn to read and write. All the children attend the group meditation session each morning. Drupon Khen Rinpoche’s own stated wish is to establish a supportive environment, where sincere students, of any nationality, have the most conducive conditions to develop as genuine dharma practitioners, and where dharma study and practice are the only activities. It can become difficult for people if they have to worry about supporting themselves while in retreat. Many serious practitioners do not have substantial means, since they give priority to the study and training of mind rather than to their mundane needs. Recognising this, the retreat centre does not charge people to stay and Drupon Khen Rinpoche has established a small foundation to support practitioners in retreat. By minimising the mundane and shedding distractions, the daily schedule of teachings, four meditation sessions and study at Sekhar encourages the retreatants to engage wholeheartedly with what is truly beneficial. In this unique environment, teachings and personal instructions are far less likely to be left as dry information and dusty notes when, without delay, they are taken back to the student’s room and applied to their own mind in practice. To say that such conditions for long-term study and practice under the care and guidance of a qualified lama are rare these days is an understatement. Many students and lamas are simply too busy or even unwilling to set aside mundane affairs and commit to spending a long time together in a retreat setting. Just as a seed needs earth, sunlight and rain to grow, the causes of progress and awakening lie within each of us, but whether we can bring these to fruition depends on the coming together of many conditions. Like a loving parent, Drupon Khen Rinpoche works without respite to create all the conditions at Sekhar that will bring about the blossoming of the students’ inherent nature. In what follows, in his own words Drupon Khen Rinpoche describes Thrangu Sekhar Retreat by way of the Five Excellences. The Five Excellences of Place, Teacher, Time, Dharma and Retinue are often used in both Sutra and Tantra as a way of describing all the various elements present when Dharma teachings are being authentically transmitted. Milarepa spent a long time in this place, blessing it with his presence and practice. The account of his time on this hillside tells of how Milarepa had been meditating with such perseverance and paying so little heed to his physical needs, that he appeared more spirit than human. One day some hunters happened upon him as he was meditating. Shocked and frightened by his appearance they demanded that he reveal himself as either man or ghost. When he remained silent and unmoving the huntsmen released a barrage of arrows at him. When none of the arrows found its mark the men set upon Milarepa, intent on his destruction, but try as they might they were unable to harm him for he had the attainments of spiritual practice. Defeated and awed, the hunters descended the hillside excitedly discussing the wonders they had witnessed. Chira Repa, a student of Milarepa, was meditating further down the hill when he overheard the huntsmen. He knew immediately who they were talking about and informed them that they had, indeed, met a special practitioner. Word soon spread of the ‘adept on the hillside’ and when these tales reached the ear of the King of Bhaktapur, he became filled with faith and reverence. One day, a statue of Tara in the palace temple uttered a prophecy to the king. She said that it would be highly auspicious for the land of Nepal if he were to offer Milarepa the special piece of cloth and medicine that he had stored in his treasury. Accordingly, he sent a Tibetan speaking envoy with the offerings and an invitation for Milarepa to accompany the envoy back to the palace. On receiving the invitation Milarepa replied that he had no business going to towns and palaces visiting kings, and that he would follow his Lama’s advice and remain meditating in isolation. The envoy warned that it would be foolish for a simple yogi to refuse the hospitality of the king, to which Milarepa sang a song proclaiming himself as a true king, due to his power and contentment attained through Dharma practice. this life and all future lives are filled with bliss! The retreat centre is situated on the very hillside where these wonderful events took place. Our Teacher is Kyabje Thrangu Rinpoche, tutor to HH 17th Gyalwang Karmapa. In the retreat centre he mainly gives ripening empowerments but also liberating instructions, supportive reading transmission and general advice and guidance on the path. We have Drupon Khen Rinpoche Karma Lhabu, who resides at the retreat and gives ripening empowerments and comprehensive liberating instructions for all the stages of teaching, from the preliminaries through to the main practices. We also have Drupon Lama Dawa Phurbu, who teaches the ritual traditions and practical aspects for all of the practices. Furthermore, we have Drupon Khenpo Wangchuk, who elucidates the treatises. In this way, the teachings and transmissions are taught fully and correctly. The students at Sekhar are engaged in retreat programmes that vary in duration. There is the three-year-three-fortnight retreat which follows the tradition established by the past masters, where the complete path of practice is undertaken, from the preliminaries through to the paths of method and liberation. This tradition is based on the Glorious Kalachakra Tantra, which teaches that full awakening can be attained in three years and three fortnights, through the purification of all karmic winds into wisdom wind. Secondly, these days many people from various backgrounds wish to dedicate themselves to the practice of Dharma in an authentic manner. Considering what would be most effective, Drupon Khen Rinpoche formulated a six-year retreat programme. The first year is dedicated to the preliminaries, the second to the awakening mind (bodhicitta), the third to Vajrasattva and confession, the fourth to calm abiding (shamatha), and years five and six to the practice of insight meditation (vipashyana). Mind training (lojong) is given special emphasis throughout the six-year programme. Thirdly, there are those who practice here according to the time they have available, remaining in retreat for a week, a month, a year and so on. Concerning Dharma, the emphasis at Sekhar is on practice and the pith-instructions, with some treatises being taught to supplement them. Mind training is taken as the foundation, as it is the basis upon which the Kagyu paths of method and liberation, dzogchen of the Nyingma, and all the profound tantras are practised. The profound Dharma is presented to the retreatants in such a way as to make it especially relevant and suitable to practitioners of today. The excellent retinue is made up of those who have studied the three baskets and taken their learning to completion, and those who have practised the three trainings well and have gained experience. There are many khenpos, tulkus, lamas and lotsawas, and the community is made up of men and women who have either gone forth as monks and nuns, or who hold the lay genyen vows. Although there are numerous backgrounds and nationalities represented among the retreatants, all have come to practise at the retreat centre inspired by their conviction in the existence of past and future lives, renunciation for cyclic existence and belief in karma, cause and effect. Each one can be considered part of the retinue of the retreat centre, which consists solely of people dedicated to authentic practice. Regarding those who wish to come and practice in the retreat centre, no distinctions will be made in terms of gender, race, religion or anything of that nature. It makes no difference whether or not one has gone forth as a monk or nun, or if one is not even a Buddhist. However, one’s level of practice and personal situation will influence what teachings one will receive. Those who have fallen out with their Lama will not be allowed to come or stay in the retreat centre. Going against one’s Lama is harmful both personally and for the buddhadharma in general. For obvious reasons, anyone involved in any kind of unlawful activity will also not be permitted to stay. Potential retreatants must be physically and mentally well enough to stay at Sekhar, as the environment here is not conducive for people with serious illness or mental health issues. This is not due to a lack of care for such people, but because they could find remaining in strict retreat uncomfortable or even counter-productive, potentially causing them and their dharma friends to experience many difficulties. In such cases it’s better that they don’t stay in strict retreat but instead practise in a more open and relaxed environment where there is more flexibility in the schedule. Since many of the retreatants have come a long way and undergone great hardships in order to practise here, every care needs to be taken to ensure that their aspirations for dharma are fulfilled. The minimum requirement for anyone wishing to stay in the retreat centre is that they are able to follow the basic programme of four practice sessions and one teaching session each day (but exceptions will be made in cases of illness or other unexpected circumstances). The other requirement for staying here is that retreatants are able to follow the retreat rules, which have been established to promote a harmonious environment that is conducive to practice and study. For example, it is not permitted to interfere in that which does not concern one, to mind the business of others, or tell others what they should and should not be doing. The retreat centre’s main objective is to offer people all they need to progress along the path to enlightenment, so that in the short term they are able to alleviate their own and others’ suffering, and ultimately they and all beings may come to realise the deepest truths of reality.